A vintage wedding dress can make an absolutely beautiful and unique statement. Take the recent wedding of Sarah Clark (unknown but for her choice of wedding dress) who married in the same dress as not only her mother, but her grandmother before her. Choosing the exact wedding date as her mother and grandmother is possibly taking things a little too far, but the dress, despite being a couple of generations old, has not dated and makes a statement. With vintage you’re also not beholden to wear the exact dress you find, and can instead have quite a bit of fun remodelling it. The major advantage to buying a vintage dress, obviously, is the cost. 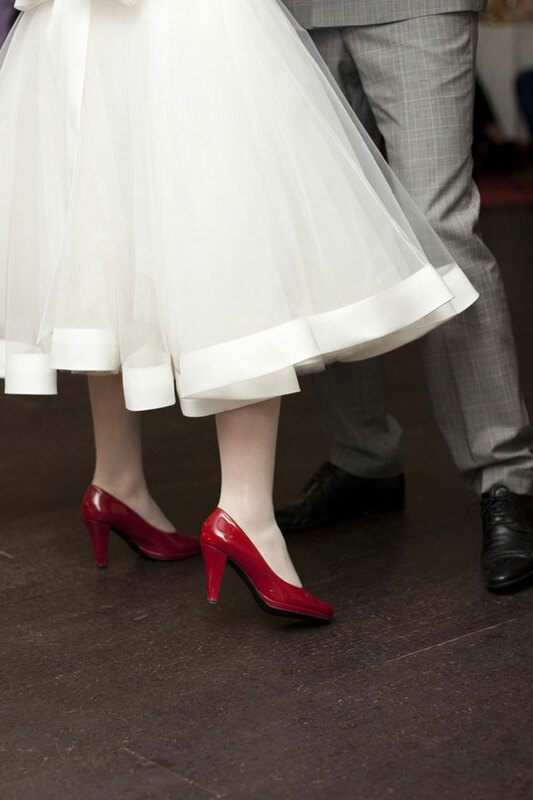 And because brides like Kate Middleton have put the 1950s back on the map, modern brides are scanning the racks of vintage and antique clothings stores, as opposed to buying ‘new’. Local vintage clothing store owner, Sandra Sutherland, claims that vintage dresses can go for roughly a tenth of the price of new off-the-shelf rendition. The dresses from the 1950s, interestingly, have made a major comeback, not only because of the recent royal wedding. They’re also less damaged than dresses from the 1940s and less ‘dressy’. Many of them are also floor length for those brides who favour romance, and many of them are lacy. But don’t dismiss the 1960s, which can function easily as a mini dress for brides after a modern look, or the 1970s, which can function in much the same way as the 1950s dresses – they also offer romance, even if they come without the lace. And you can do absolutely anything once you’ve found a basic vintage to work with – take up the hem, open the neckline, make it strapless, remove or add sleeves. The great advantage to vintage is that they’re commonly made from incredible fabrics like raw silk that today would cost an enormous amount to emulate.